For the past 10 years, Fantagraphics has been publishing The Complete Peanuts–every strip daily and Sunday of the 50 year career of Charles Schulz. Off the top of my head, any given volume includes the following: The Great Pumpkin, the World War One Flying Ace on his Sopwith Camel, Beethoven, D Minuses, Security Blankets, Fuss-budgets..all part of the fabric of our lives…and the list goes on and on. 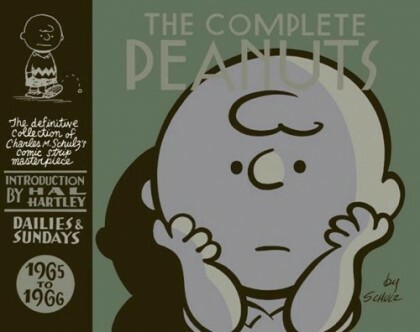 So far 18 volumes have been published–each collect an entire two years of Peanuts strips. Like anything that lasts for 50 years, there are high water marks and there are some creative slumps. Are there some volumes that are must haves? Look at the center panel– we’ve all put on a coat that angrily. thanks Mr. Schulz! Good Lord (did someone say ‘grief’? ), my older sister treated me like dirt when we were kids….Thanks Linus! And there is plenty of the old magic to go around. Snoopy tries his hand at professional tennis with his adversary/doubles partner the malevolent Molly Volley. 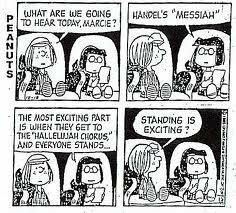 What pressure– Poor Snoopy– their facial expressions in panel 4 tell it all. Amazing what Schulz could convey in one simple picture! These three volumes are my personal favorites, but no matter what volume you try, you are in for a real pleasurable reading experience. These are books you will keep and re-read the rest of your days. Do yourself a solid and buy a volume of The Complete Peanuts. You can’t lose!